Braised chicken is something I turn to again and again when I need to get the dinner on the table, using items that are in my fridge and pantry. If I can avoid an extra trip to the grocery store, then I consider dinner prep to be a success! It all started with my Braised Balsamic Chicken recipe, and now I branch with different herbs and spices, and vegetables. 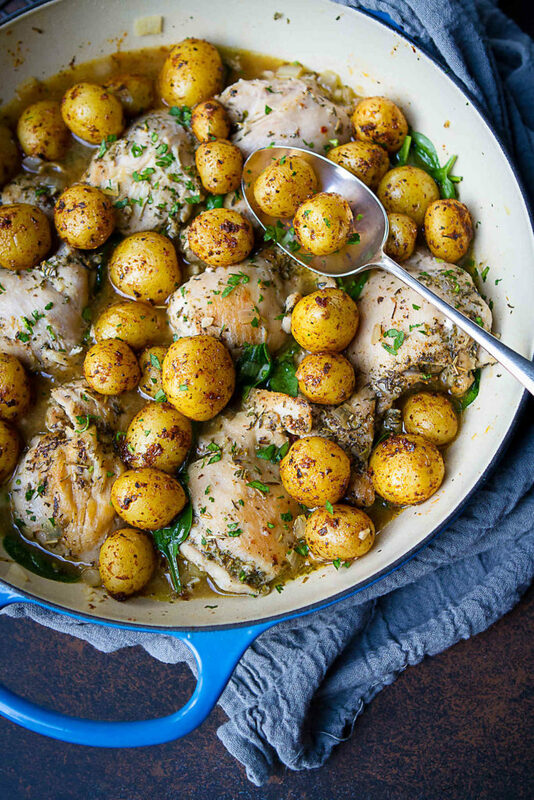 This one-pot chicken and potato recipe has everything you need for a healthy dinner. Protein – check. Carbs – check. Green veggies – check. Plus, there’s minimal chopping, no potato peeling (more on that in a second) and loads of flavor that even the kids will love. Serve it on its own or over cauliflower rice or quinoa, which will soak up the extra sauce well. I’ve always been an advocate for the Creamer potatoes from The Little Potato Company because they are, hands down, my favorite potatoes. However, I haven’t spent much time telling you about their Microwave Ready potatoes, which are so handy for weekday dinners. The snazzy new packaging has everything you need to cook the potatoes – fresh potatoes, a seasoning package and the actual container (it’s microwave safe and BPA free) that the potatoes are cooked in. 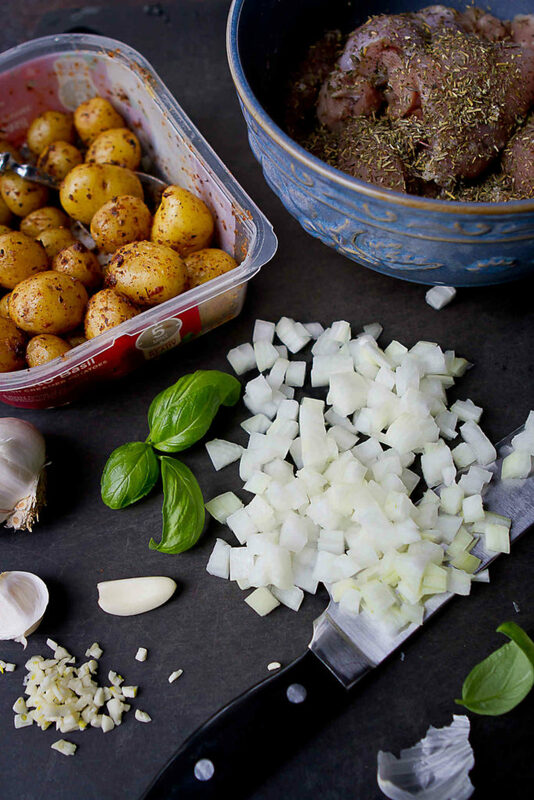 And the potatoes are ready to go – no peeling or washing required. For this recipe, I used the Tomato Basil flavor, which works so well with the seasonings in the chicken. The Garlic Parsley and Savory Herb flavors are also great options. All you do is peel back the cover, remove the seasoning pack, place the cover back in place and cook in the microwave for 5 minutes. 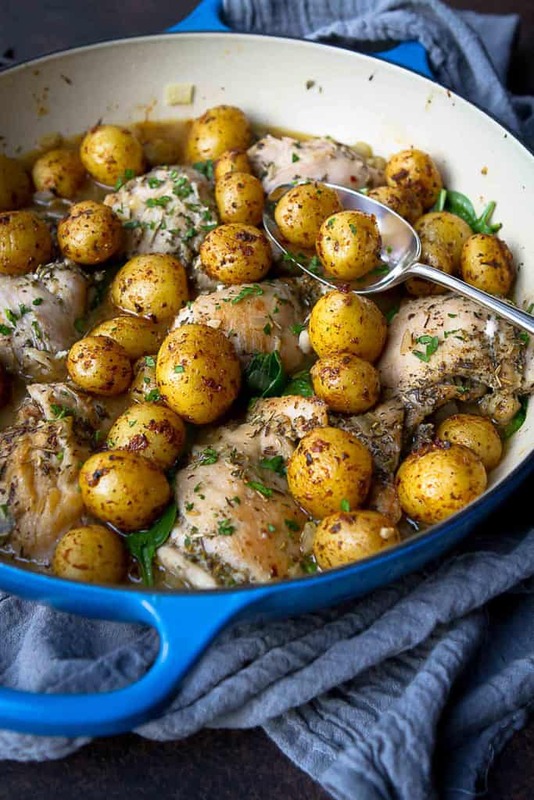 Perfectly tender, flavorful Little potatoes that are great for eating on their own or stirring into a dish like this chicken one. 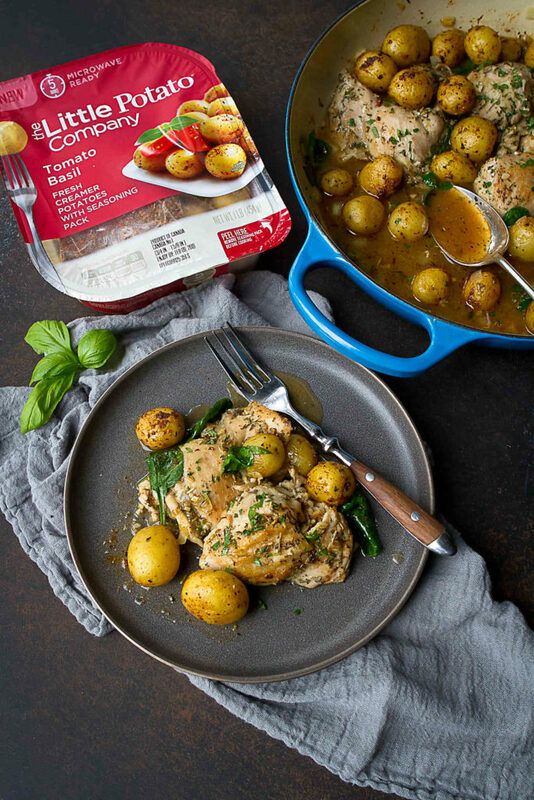 Creamer potatoes: As I mentioned above, I used the new flavor, Tomato Basil Microwave Ready kit from The Little Potato Company, and the flavors worked perfectly with the herb rub on the chicken. However, the Garlic Parsley and Savory Herb flavors would also work well in this recipe. Chicken: When braising chicken, 99% percent of the time I turn to boneless, skinless chicken thighs because they are incredibly tender and hold their moisture well. Give them a little trim to remove the extra fat before tossing with the herbs. 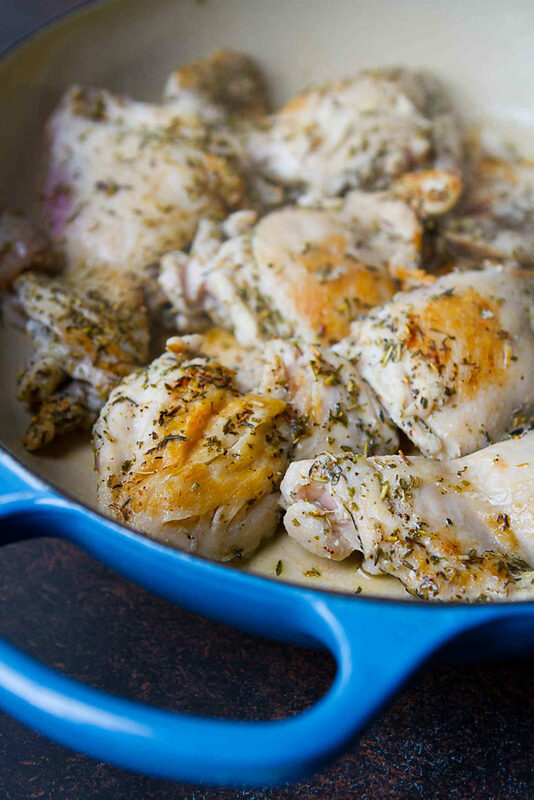 Herb mixture: A combination of dried rosemary, thyme and oregano, along with salt and pepper, lends a ton of flavor to the chicken. Aromatics: Start the dish off with some sautéed onion and garlic for a good base of flavor. Chicken broth: One cup is all you need for simmering the chicken. Start by cooking the potatoes, following the directions on the package. In the directions, there’s an option to add 2 tablespoons of olive oil, but this recipe doesn’t require it. Once the chicken broth is added to the pan and coming to a boil, use a wooden spoon to scrape any browned bits from the bottom of the pan. This will add a wonderful layer of flavor to the broth. • Before adding the spinach, remove the skillet from the heat to avoid overcooking the spinach. The goal is for the leaves to be just wilted and bright green. Prepare the Little potatoes according to the package directions. Set aside. Heat 1 teaspoon olive oil in a large nonstick or ceramic skillet set over medium-high heat. Add the chicken and cook until browned, about 2 minutes per side. Transfer the chicken to a plate. Reduce the heat to medium and add the remaining 1 teaspoon olive oil. Add the onion and cook until tender, 4 to 5 minutes. Add the garlic and cook for 30 seconds. Hi, I am just wondering if you can sub in the regular little potatoes as I don’t have a microwave. What would you do about the seasoning mix? 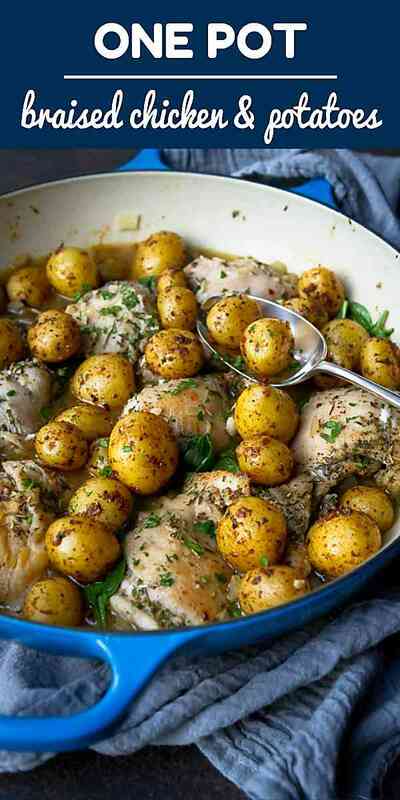 Would you omit it or add in some basil to the potatoes? Hi Elizabeth, I would add some seasoning, such as dried basil, paprika, salt and pepper.